Beverly Hewitt, age 86, formerly of Madison, passed away Friday, February 8, 2019 at the Rolling Green Village in Nevada, IA. Funeral service will be 2 PM on Friday, February 15th at Weiland Funeral Chapel with Rev. Elizabeth Pagnotta officiating. Visitation will be one hour prior to the service. Burial will be in Graceland Cemetery. 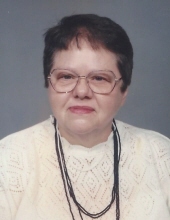 Beverly Ann Gile was born December 12, 1932 in Madison, SD to Birch & Joyce (Welling) Gile. She married Marlin Hewitt in Pipestone, MN. The young couple made their home in Madison for several years before moving to Nebraska. They lived there a few years before moving on to Dallas, Texas and eventually they made their way back home to Madison in the mid-1960s. Shortly after moving back, Beverly began working at Bethel Lutheran Home as a nurse’s aide. After working there for a short time, she began working as a nurse’s aide at the Madison Hospital in 1966 and worked there until her retirement in 1999. In 2008, she moved to Nevada, IA to be closer to family. Some of her hobbies were embroidery, tending to her flower gardens, watching movies and being with her many pets. She loved her entire family so much and cherished the moments when they were together. While living in Madison, she was a member of St. John Lutheran Church. Beverly is survived by her two sons, Steve (Judy) Hewitt of Nevada, IA and Mark (Renee) Hewitt of Great Falls, MT; seven grandchildren, Trace (Becky) Hansen, Ross (Allison) Hansen, Heath (Tennille) Hansen, Shane (Shari) Hansen, Reed (Nicole) Rogne, Jenni (Tyson) Thormodsgaard and Todd (Lacey) Hewitt; nine great-grandchildren; sister, Janice Amundson of DeSmet, SD and two nephews, Troy (Diane) Sturgeon of Sioux Falls and Jason Amundson of DeSmet, SD. She was preceded in death by her parents; husband, Marlin and daughter, Linda. To send flowers or a remembrance gift to the family of Beverly Hewitt, please visit our Tribute Store. "Email Address" would like to share the life celebration of Beverly Hewitt. Click on the "link" to go to share a favorite memory or leave a condolence message for the family.